Experiencing property damage from a natural disaster could end up costing you plenty of money. 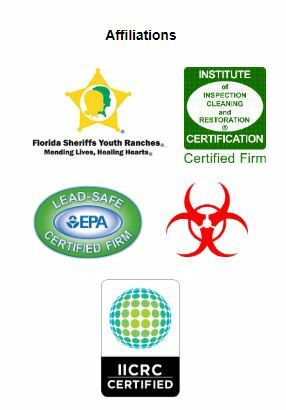 The damage from natural disasters such as flooding, fires, and mold can result in significant losses and restoration services can get expensive depending on the damage. Homeowner’s insurance can cover the costs of restoration services and damage claims in most cases, but if the type of damage is not covered or if you choose not to file an insurance claim, the cost falls on you. ServiceMaster 24 Hour offers affordable options through our FlexServ program to help homeowners in Largo, FL who cannot cover the costs through their homeowner’s insurance policy. Our FlexServ options involve equipment rentals and professional assistance to reduce the cost of the restoration. The technicians of ServiceMaster 24 Hour help homeowners choose from our FlexServ options to develop an effective service plan. 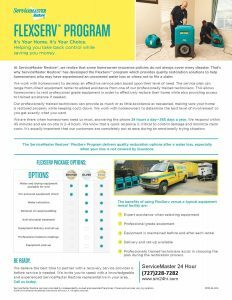 These options include rental of our professional grade equipment and assistance from our technicians to help homeowners complete the restoration themselves. We can help you decide on the right level of additional assistance based on the damage and we will work with you to keep your restoration costs within your budget. Gold: Delivery and set-up of equipment, professional moisture readings, and equipment pick-up in addition to Bronze and Silver level services. If your home in Largo, FL has been damaged in a disaster and your insurance policy does not cover the specific damage, call ServiceMaster 24 Hour to talk about your options through FlexServ. We can work out a plan with you that includes rentals and assistance to help reduce the cost of the restoration. You can call us anytime at (727) 228-7282 to learn more about our FlexServ program.